A FLOURISHING garden centre is sowing the seeds for success after boosting its management team. 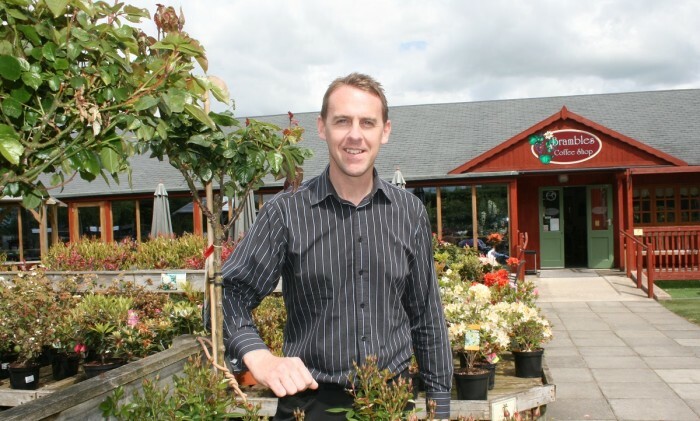 Paul Barker has been appointed as General Manager of DBC Member, Poplar Tree Garden Centre, located in Shincliffe Village on the outskirts of Durham. He will be responsible for the day-to-day management of Poplar Tree and its award-winning Brambles Coffee Shop. Paul joins Poplar Tree – which is Durham City’s only garden centre – after almost 20 years working at centres across the North East. He said: “This was a perfect opportunity for me as Poplar Tree is the premier garden centre for Durham built up over more than 40 years. It has a great reputation amongst its loyal customers and within the sector as well. Poplar Tree was bought and redeveloped in 2003 by Frank and Sue Curry of Brambledown Contracts Group Ltd. who run the Centre with the assistance of their son Paul and daughter Caroline. Over the past few years, Poplar Tree has been transformed with the addition of two cafes with seating for 300 people, a function suite, extensive grounds as well as departments selling plants, garden sundries, giftware and its own Interflora Florist. It also hosts a variety of community-based events ranging from the annual sponsorship of Durham In Bloom, to business networking events and charity fundraisers. Caroline Walker, Poplar Tree’s Marketing Manager, said: “We are delighted to welcome Paul to the Poplar Tree team. He has the knowledge, experience and the integrity from managing several centres for Wyevale Garden Centres and a great enthusiasm for his work. We wish Paul well and thank him, Caroline and staff for their fantastic hospitality at the recent DBC event where he played quiz master!